Before we get into the nitty-gritty details over this specific port, here’s a quick refresher for the scant few not familiar with the first Sonic title. Sonic the Hedgehog is a platforming game staring the titular Sonic the Hedgehog stopping the evil Dr. Eggman from turning all the animals into robots and taking over the world. As Sonic, your goal is to simply reach the end of a stage called an “Act” while dodging enemies and hazards, the exception being the Act 3 stages where you instead have to reach the end and fight Dr. Eggman. Unlike other platformers at the time, Sonic the Hedgehog took a different approach to level design and control. There’s no dedicated run button, instead Sonic gradually builds up speed by simply holding left or right. Meanwhile the level design itself puts special emphasis on physics. Sonic himself is effected by the physics of terrain like slopes and loops, such as speeding up when rolling down a hill or the opposite where he slows down when climbing up a hill. In general the game puts emphasis on speed, both gaining raw speed and keeping that speed. To encourage this, multiple gameplay mechanics are enforced to encourage the player to keep moving. Sonic is effectively invincible as long as he has one ring (exceptions being crushed or falling down a pit), his ability to curl up into a ball allows him to attack enemies at any angle while jumping, and he can attack and move at the same time using the Spin Attack. Of course while you can just blaze past everything, the game also gives you an incentive to play through the stages wisely. By reaching the end of an Act 1 or Act 2 stage with a least 50 rings, you’ll get the chance to try out a Special Stage. The goal of the Special Stages is to guide Sonic through a rotating maze, avoiding the “Goal” spheres along the way. Completing one of these stages will get you a Chaos Emerald, with 6 Chaos Emeralds total. If you can collect every Emerald and beat the game, you’ll be rewarded with an alternate “good” ending. This of course being backed up by a pretty stellar presentation. The SEGA Genesis/Mega Drive is known for it’s limitations, such as it’s restrictive color palette and it’s audio capabilities from the Yamaha YM2612 sound chip. Despite this, the developers at SEGA went the extra mile to bypass the limitations, creating a game that looks vibrant and sounds great. Even to this day the game has an appealing aesthetic, such as the oranges, blues, and greens popping out on Green Hill Zone to the trippy special stages. In fact SEGA was so confident in how the game looked that they purposely pitting the game against Super Mario World, highlighting how much more colorful Sonic the Hedgehog looked. Needless to say, it worked out and Sonic became a smash hit. All that being said, the first Sonic game still has rough patches. While the game in theory encourages players to go fast, the game in reality puts a good amount of emphasis on platforming. While on it’s own this wouldn’t be an issue, there are plenty of situations where the player is almost forced to stop and wait for a moving platform or trap to move. This includes spikes popping in an out in a tight corridor, waiting for platforms to move up or down, or waiting for a conveyor to jump on a small platform. It doesn’t ruin the game (except Labyrinth Zone), but compared to later titles which puts a lot more emphasis on the actual speed, it can be a tad jarring for those more used to later entries. Now with the game itself explained for all two people not familiar with Sonic the Hedgehog, what exactly does this version of the game have compared to the dozen or so other versions out there? Well for veterans of the series, SEGA AGES Sonic the Hedgehog adds two moves to Sonic’s controls, the Spin Dash introduced in the game’s sequel Sonic the Hedgehog 2 and more notably the Drop Dash used in more recent Sonic titles like Sonic Mania and Sonic Forces. While the former has appeared in past ports such as Sonic Jam, Sonic the Hedgehog Genesis, and Taxman’s version of Sonic 1, the latter is a first. But if you’re a purest, you still have the option to disable these two moves at the cost of resetting the game. When Sonic has both moves available, the game feels remarkably different. Despite the levels themselves being unchanged, Sonic having access to multiple ways to quickly accelerate means those aforementioned flaws become more tolerable. From my experiences this is possibly most notable with the Labyrinth Zone levels. Normally that level is notorious for the sluggish pacing due to a combination of the SEGA Genesis lagging and the water heavily slowing down Sonic, but with access to both moves you can easily shave off precious seconds. The two moves are also generally useful for those that get a thrill from speed running, with the more open zones such as Green Hill Zone and Starlight Zone benefiting from the ability to gain speed quickly. The only drawback to all this is that due to the heavier focus on platforming, the Drop Dash doesn’t have a lot of the same usage as Sonic Mania or Sonic Forces. While the burst of speed is nice, there’s more of a risk of Sonic rolling into a stray pit or getting crushed by moving blocks, meaning that you can’t just simply spam the Drop Dash and win the game. 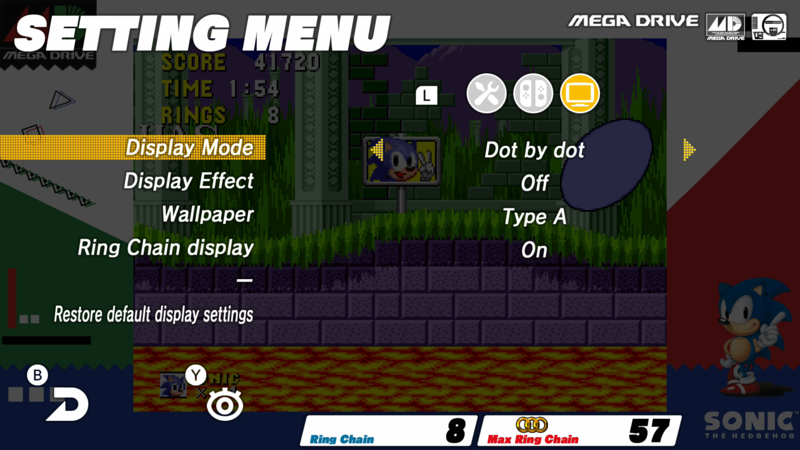 Another new feature is the ability to play the Mega Play version of Sonic 1. This version originally for the “Mega Play” series of arcade games is effectively a variant of the game with several key changes. Every stage has a time limit that counts down, unlike other versions which counts up instead. This depends on the stage in question, for example Green Hill Zone Act 1 being nearly a minute while Spring Yard Zone Act 3 is 3 minutes. 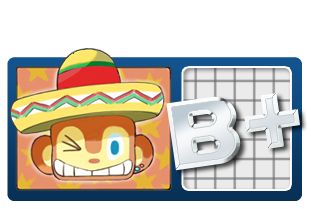 The objective is to beat the stage with this time limit enforced; failing to so will cost the player a life. The stage order is also different, with Marble Zone and Labyrinth Zone being absent. For example after beating Green Hill Zone Act 3, you’ll skip to Spring Yard Act 1 instead of going to Marble Zone like normal. This was likely done due to the arcade nature of this port, as staying too long on the Labyrinth Zone or Marble Zone stages could be a real issue for arcade owners. Overall this is an interesting version of Sonic the Hedgehog since it’s effectively a “hard mode” in a sense. You can’t gain lives per credit and you are constantly pressured to move due to the time limit, making the game more challenging despite the shorter length. This is also a good mode for those that want to practice speed running, since the emphasis on hurrying to the end means that you’ll get a good impression on the level layout through multiple playthroughs. But for those that aren’t interested in a “harder” version of Sonic 1, it’s still completely optional in the settings. Aside from those key features, there are also more minor features. The player has the option to select multiple display modes and borders. By default the player uses the “Normal”, “Off”, and “Type A” settings respectively, but the player has the option to toggle between several options. This includes an assortment of different generic wallpapers, different filters like smoothness or scanlines, and different aspect ratios such as a stretched 16:9 aspect ratio or a generic 4:3 ratio. For the sake of this review, the miscellaneous screenshots shown here uses the “Dot by dot” Display Mode, as is creates an even 4x pixel scaling. You can also change the region between the Japanese and International versions, along with the ability to change the control scheme to your liking. 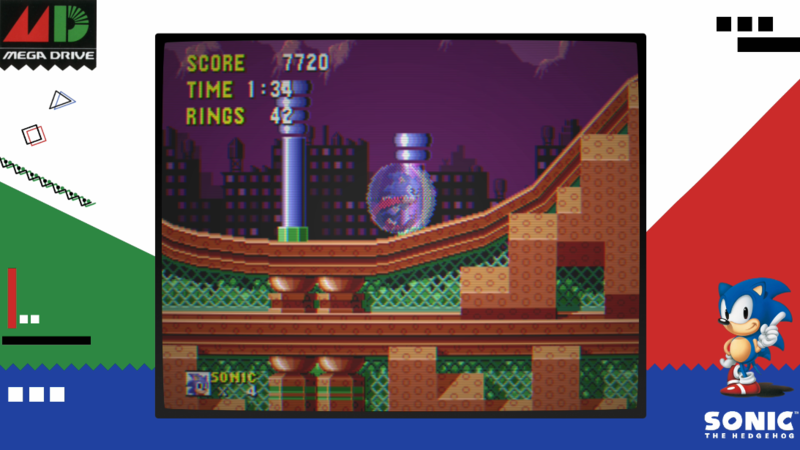 Three other modes includes “Ring Keep”, which is effectively the same game but Sonic now keeps half of his rings when hit and the game actively keeps track of your Ring Chain. Time Attack! mode where you try to beat Green Hill Act 1 as fast as possible. Finally there is Score Attack!, with the player tasked to get the highest score on the Mega Play version, with the catch being that the player only has a single life to work with. In the latter two cases, your score will be uploaded to a leaderboard, giving you a good idea of how your score compares to others. Even if ignoring all of the above, this is still an overall a solid port from a technical standpoint. From my playthroughs of this game, I haven’t noticed anything unusual exclusive to this port, whether it’s audio or visual glitches. Anything related to glitches are from the original, and the developers at M2 did not try to hide these minor flaws. 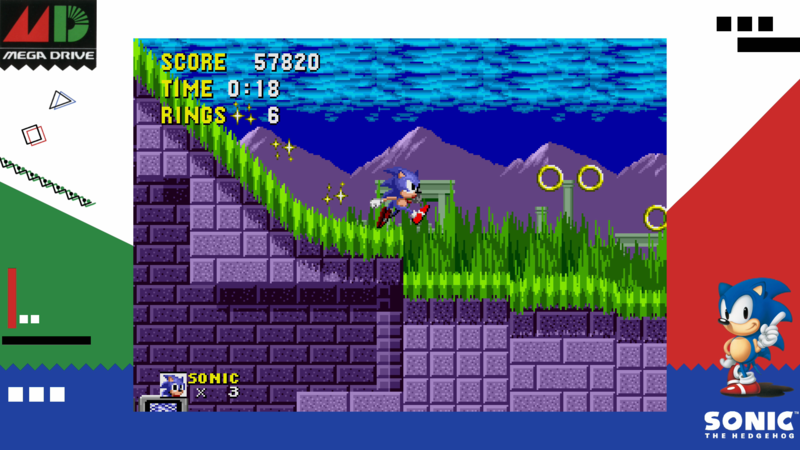 For example the occasional graphical glitch where the crumbling edges in Green Hill Zone don’t collapse properly are still retained. Now the ultimate question, is this the best version of Sonic the Hedgehog? Well I’d argue it’s at least one of the best versions available due to it’s unique features not available anywhere else, but at the same time it still has to contend with the Android/iOS version of Sonic 1. 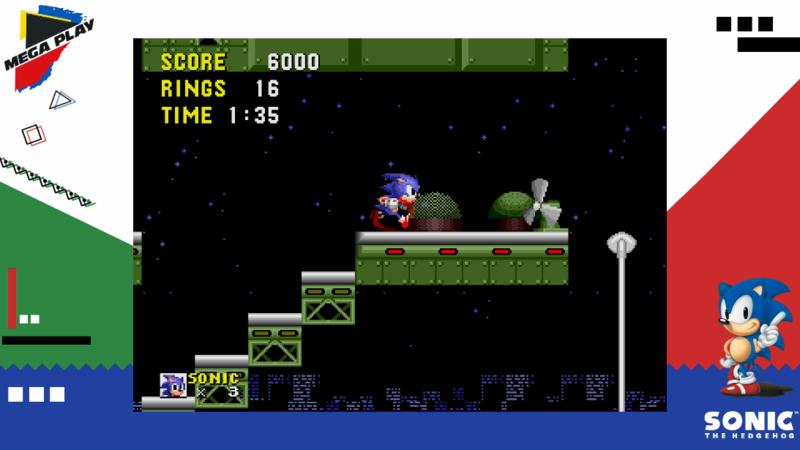 Not only is that version effectively free (albeit with ads), it also includes features that SEGA AGES Sonic the Hedgehog lacks such as the ability to play as multiple characters and a true 16:9 aspect ratio. 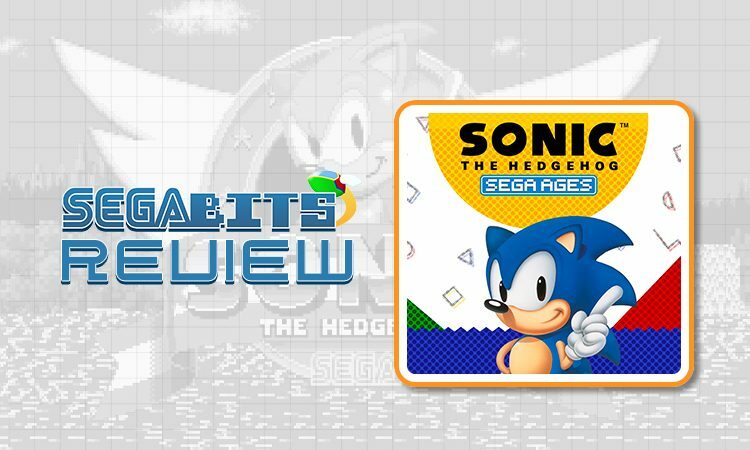 If you must get SEGA AGES Sonic the Hedgehog, it’s gonna have to be for the bonus content like the Drop Dash and Mega Play version. Otherwise there are a lot of other versions of this game you can still get, plus possibly a bunch of other games too if getting one of SEGA’s many compilations. Still at only $8, there’s little risk to at least try out this version if you have a Nintendo Switch on hand and some pocket change. Why is Sega putting this on the worst platform out of them all. Talk about a mother missed opportunity. Worst platform? May be. But still it’s the BEST HANDHELD SYSTEM now. Are you saying the Switch is bad? It’s a bad platform choice for Sega to be putting exclusives on and it’s a Nintendo console. Not that it is bad in itself for Nintendo fans of course. Here is my review for you: retarded moron with Asperger’s.